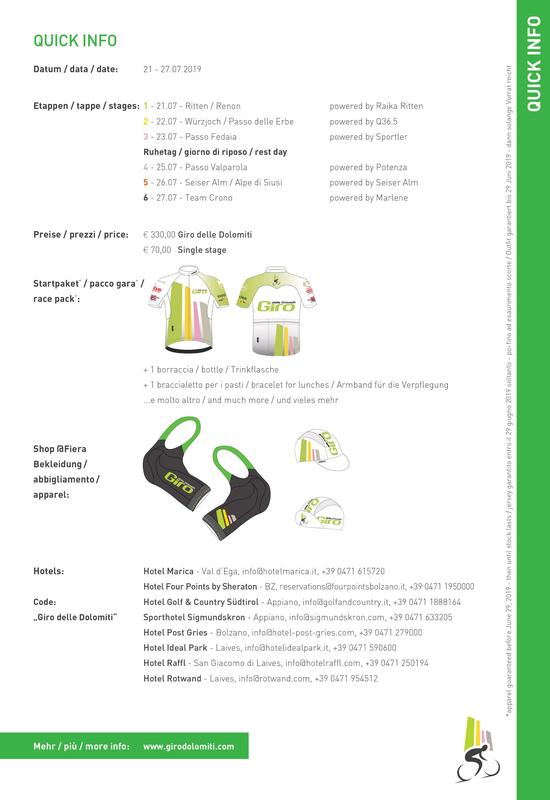 The enrollment is made online; if you are a club’s president or if you want to register more riders (minimum n. 5), you can download the form of the enrollment and send it by email to girodol@girodolomiti.com. Registrations are open for all those who are born before 20 July 2001. Please choose at least one stage! You can select individually up to 5 stages. If you select the last three stages, you automatically fall into the Short Giro. For all the athletes is obligatory to present the Health Certificate (download format on the site www.girodolomiti.com section PRESS & DOCS). I have no insurance - I would like to insure myself with "Potenza Assicurazioni-Insurance", partner of the Giro delle Dolomiti. The official Jersey of the Giro delle Dolomiti 2019 is secured for the enrollments made until 30/06/2019 ; for the enrollments made after this date, only while stocks last. By selecting this box I give the consent for sending promotional and marketing communications through automated tools (email, etc.) and paper mail or telephone with operator. I want to add in the race pack for € 10 the illustrated book with all the routes of the last 40 years of the Giro delle Dolomiti.